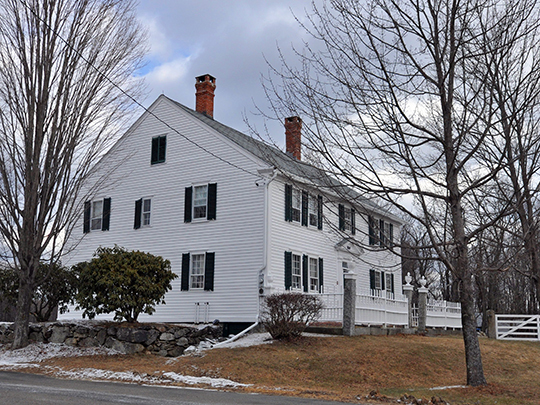 Hillsborough Town Hall is located at 27 School Street, Hillsborough, NH 03244; phone: 603-464-3877. Photo: Jonathan Barnes House, ca. 1774, North Road, Hillsborough, NH. Listed on the National Register of Historic Places in 1982. Photographed by user:Magicpiano (own work), 2013, [cc-by-3.0 (creativecommons.org/licenses/by/3.0)], via Wikimedia Commons, accessed March, 2014. While the county is named for England's Earl of Hillsborough, the town gets its name from the founder, Colonel John Hill of Boston. The name was originally spelled without the 's' — Hillborough. As inconsistent as it may be and seem, within 5 years of the Puritans landing at Massachusetts Bay, they began to complain of being overcrowded. With a view of enlarging their plantation, a survey of the Merrimack River was made in the summer of 1638, the first rude plan of the inland country returned to the courts of Massachusetts by John Gardner, who had a descendant living in Hillsborough, which fact links the history of the town very clearly with the early colonization of the State. John Hill and his partner, Mr. Keyes, secured a grant of "Number Seven" and the first person willing to venture to settle there was Samuel Gibson, a Scotchman from Boston. This initial grant is dated December 29, 1737. In September of the following year Gibson obtained additional land. Alexander Turner of Worcester, Massachusetts, a husbandman, bought 52 acres in 1738. James Meyer of Boston purchased 200 acres the same year. Jabez Huntington of Norwich, Connecticut purchased 70 acres. George Waldo Browne, The History of Hillsborough New Hampshire, 1735-1921, Volume One, John B. Clarke Company, Printers, Manchester, NH, 1921.